US, 1982, 92 minutes, Colour. Jack Palance, Martin Balsam, Donald Pleasence. 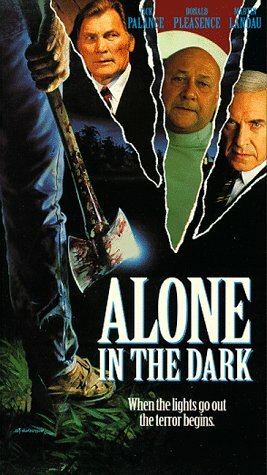 Alone in the Dark is one of many multiple murder thrillers made in the late '70s and early '80s. These films have their origin in John Carpenter's Halloween. This film has particular references to Halloween with Donald Pleasence reappearing as a doctor associated with a mental asylum. The film has an exciting, opening sequence which turns out to be a nightmare. The rest of the film is conventional - at least in comparisons with similar films of this kind. There are strong maniacal performances from Jack Palance and Martin Landau. 1. The popularity of the multiple-murder thriller? Nightmare aspects? imagining the unimaginable? Death, violence, nightmare? 2. Technical qualities: New Jersey atmosphere, the mental hospital, the town, the homes, the rock In roll festival? Use of light and darkness, night and day? Colour? The musical score? Atmosphere? 3. The title and its evocativeness? Indication of themes? 4. The portrait of the inmates of the asylum? Audience response to asylums - realistic, caricature? The homicidal maniacs? Maximum security? Frank Hawks and his experience of war? Byron and his experiences of burning churches, Fatty and his child-molesting, Scag (keeping his face to the wall) the Bleeder because of his bleeding when he murders? The opening sequence with Byron's nightmare? 5. Dr Potter and Dr Bain? The running of the asylum? Philosophy of dealing with the inmates? Dr Potter and his experiences? Disappearance? Dr Bain and his experiences? Dr Merton and Hawks' suspicions about deaths in the hospital? The possibilities for the inmates to explore and live out their fantasies? 6. Dr Potter and his family, his daughter and the babysitter, his wife, her neurotic sister, the punk rock? The experience of the power failure and the release of the prisoners? The ups and downs of the family - especially Toni and Nell being arrested? (The ironies about the nuclear power station?) Their encounter with Tom Smith, his friendship? 7. The inmates being released? Their terrorising the town? The Potter household? Bunkie and Billy being killed? Tom returning home? Detective Curtis?. 8. The battle in the house? Bain's appearance? Hawks? The Potters and their violent defence of themselves? The deaths of Fatty and Byron? The discovery that Tom is Scag because of his nosebleed? Hawks with the family? The device of the television being restored and Dr Merton being interviewed? 9. Jack Palance's sense of menace as Hawks? His being aloof from the other maniacs? Yet his presence in the mayhem? His presence at the end - and his moving amongst the punk groups? 10. The film's ironic comment about the punk groups and the maniacs - difficult to tell the difference between them and their behaviour? 11. The value of this kind of film - as entertainment, as exploring the dark side of the psyche?